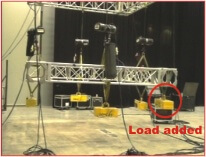 Experiments for measuring loads and load distributions that occur in day-to-day stage rigging scenarios. 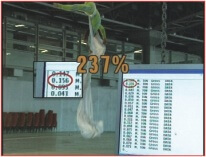 In its January 2007 meeting, ESTA task group on chain hoist usage has decided to have its member Eilon Engineering conduct an experiment aimed at measuring loads and load distributions that occur in day-to-day stage rigging scenarios. On March 5, 2007 experiments were conducted in the exhibitions center in Tel Aviv Israel. A structure of one truss with three loads and three hoists. 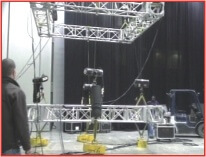 Experienced rigging personnel tried to level and balance the truss. 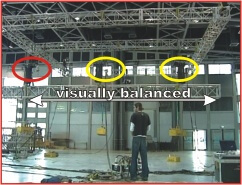 When using the load cells we could see that the attempts to balance the truss visually resulted in random balancing and imbalanced load division on the hoists. We also noticed that a slight operation of one of the hoists even for just a fraction of a second resulted in additions of hundreds of pounds, while the truss still seemed visually balanced. Conclusion: A visually balanced structure is likely to have imbalanced load division and some of the hoists might even be overloaded. 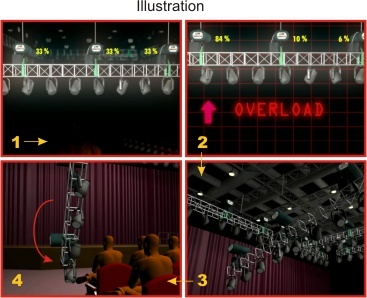 Scientifically, each time there are more than two hoists on a truss, or more than three hoists in a structure, there will occur the phenomenon known as "Statically Indeterminate Structure", which results in unpredictable load distribution. In most cases this will cause load imbalance, where some of the hoists may reach overload while others carry only a small part of the load. 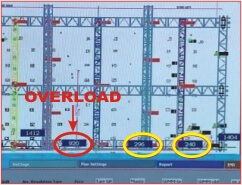 Thus, overload situations might happen to the most experienced riggers, even if each hanging point's load is calculated and the calculation falls within the limitations of the nominal hoist and truss capacity. 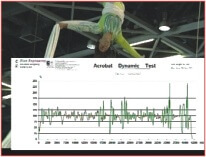 The actual load distribution on the truss is still unpredictable and cannot be calculated, or even estimated. A mother grid structure was erected. The upper grid was suspended from the ceiling by four identical chain hoists simultaneously controlled by one switch. One load cell was hung inline with each of the four hoists. An identical arrangement of grid, hoists and load cells was suspended from this upper grid. In the experiment, a slight change in the weight of the loads on the lower grid triggered a practically incalculable change in the reading exhibited by the load cells on the upper grid. Conclusion: On a mother-grid structure any changes in the lower grid load or load distribution will usually change the load values and distribution on the upper grid, which in turn might cause an overload situation. 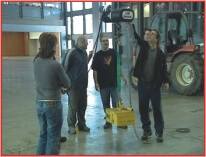 Measurement of dynamic loads involved in lifting a load with a hoist and stopping the hoist's operation. We conducted this test with both 50 ft / minute hoist and 14 ft / minute. 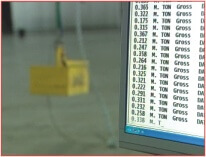 With the 50ft / minute hoist the load cells recorded max. 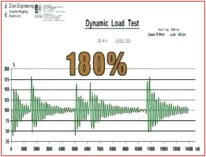 measurements of 180% of the load's weight. With the 14ft / minute hoist the load cells recorded a max. measurements of 120% of the load's weight. Conclusion: Dynamic loads exist during starting / stopping the hoist's operation. The faster the hoist is, the larger the dynamic forces are.